On the heels of these moves, the Eagles released offensive coordinator Pat Shurmur and linebackers coaches Rick Minter and Bill McGovern from their contracts, according to Caplan (on Twitter). They let go of previous D-coordinator Billy Davis on Monday, per Caplan (Twitter link). 1:40pm: The Eagles have reached an agreement with Frank Reich to make him their new offensive coordinator, according to Jason La Canfora of CBSports.com, who reports (via Twitter) that it’s a “done deal.” Reich had been scheduled to have a formal interview with the team today, and Adam Caplan of ESPN.com had suggested “it would be an upset” if he wasn’t hired (Twitter link). Reich, recently fired as the Chargers’ offensive coordinator after two seasons leading San Diego’s offense, interviewed for the same position on Adam Gase‘s Dolphins staff, but Miami ultimately chose Clyde Christensen as their new OC. Had he become the Dolphins’ offensive coordinator, Reich wouldn’t have called the team’s plays (Gase will do that), and it looks as if he won’t handle that responsibility in Philadelphia either. New head coach Doug Pederson indicated during his introductory press conference on Tuesday that he expects to call offensive plays in 2016. In San Diego, Reich was let go in large part due to the Chargers’ ineffective running game, but he did just fine with the team’s aerial attack — Philip Rivers led the NFL in completed passes in 2015, racking up nearly 4,800 yards passing to go along with 29 touchdowns. Injuries have plagued the Chargers over the last couple years, and health problems on the offensive line likely contributed to the struggles of first-round running back Melvin Gordon, but Reich took the fall for the offense’s regression. 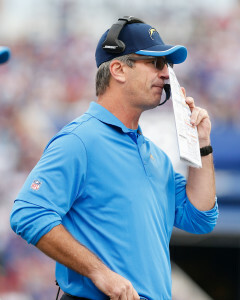 In 2014, Reich’s first year as offensive coordinator, San Diego went from second in offensive DVOA to 11th. The team slipped to 15th this season, and the Chargers also went from scoring nearly 25 points per game in 2013 to just 20 by 2015. In addition to reaching a deal with Reich, the Eagles have also reportedly agreed to hire former Browns offensive coordinator John DeFilippo as the club’s quarterbacks coach. The new additions to Pederson’s offensive coaching staff likely spell the end of Pat Shurmur‘s time in Philadelphia, despite the fact that the new head coach said on Tuesday that Shurmur would receive consideration for the OC role.